My mom is arguably one of the best cooks around. I attribute a lot of my love for food and cooking to her and my dad for making nightly home-cooked meals a priority in our house no matter how busy they were. Despite both working full-time corporate jobs and running my sister and I around to countless after-school sports and practices, there was always a nutritious home-cooked meal on the table for us to eat together. It may have only lasted ten minutes, but it was a meal nonetheless, one that brought us together while nourishing our bodies before heading off to the next volleyball practice or dance class. Despite the weekdays being crazy busy, Sunday night dinners were a staple for us growing up. We would have the same meal every Sunday with my mom’s famous beef roast, homemade gravy, mashed potatoes, green beans, and cornbread all made from scratch. It was a whole day process and I loved every minute of it. Being a lover of all things that involve sugar and carbohydrates (don’t we all! ), I would always help myself to seconds of mashed potatoes and cornbread. As I got older and realized the two sticks of butter and cups of heavy cream used to make them weren’t doing my body any good, I was determined to make a healthier version without sacrificing taste and texture. After several failed attempts and a few rejections by the queen of cornbread herself, I finally come up with the perfect recipe! 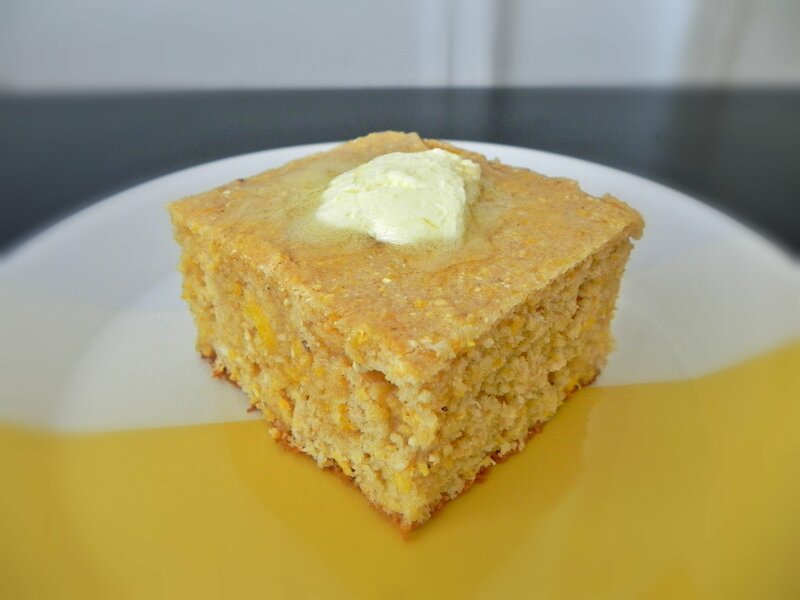 Since this cornbread is mostly carbohydrates, enjoy it with a meal high in protein and a little fat to keep it balanced and stabilize your blood sugar. Dysphagia Level 2 – Ground/Mech Soft – Omit corn and cook according to recipe. Top with extra honey, syrup, or butter to moisten completely. Dysphagia Level 3 – Soft – Omit corn and cook according to recipe. Top with extra honey, syrup, or butter to moisten as needed. Spray an 8×8″ baking pan liberally with cooking spray and set aside. In a medium bowl combine cornmeal, flour and baking powder. In a large bowl mix honey, egg, egg whites, cottage cheese, corn, almond milk, and vinegar. Add flour mixture to wet ingredients and stir until combined. Pour batter into prepared baking pan and bake in oven for 20-25 minutes or until toothpick inserted into center comes out clean. Serve warm and drizzled with additional honey if desired.